Fears about dangers lurking in the muck – microbes, parasites and amoebas, oh my! – keep some parents from letting kids do what comes naturally, which is to go outside and get messy.But here’s a dirty little secret: children who spend the better part of their free time in the company of their sterile hi-tech gadgets rather than playing outside, are more vulnerable to obesity, ADHD, vitamin D deficiency and depression. There’s a growing body of research that suggests overprotecting kids from dirt and germs may actually inhibit their physical health and resilience. Activities kids love, such as making mud pies, splashing in puddles and rolling down hillsides are actually a grubby prescription for health and happiness. The Hygiene Hypothesis developed in the 1980s says that when kids are too clean and their exposure to parasites, bacteria, and viruses is limited early in life, children face a greater chance of having allergies, asthma and other autoimmune diseases. Children’s stress levels fall within minutes of seeing green spaces, according to a 2004 study in the American Journal of Public Health. When children are exposed to germs and pathogens during infancy, their risk of cardiovascular inflammation in adulthood is reduced, according to a 2010 Northwestern University study. A friendly bacteria found in soil helps produce serotonin, which enhances feelings of well-being, much the same way that antidepressant drugs and exercise do, according to a 2007 Bristol University study. Give your child a stick and a muddy surface to draw on. Mistakes are no problem. Just smooth them over and start again. Mud balls can become out-of-season snowmen or abstract sculptures. If your child’s creation isn’t sticking together, just add more water. Children can make buildings of all shapes and sizes if they use sticks to create a frame and pack mud on to it. Houses or forts perhaps, a castle with a moat, or a stable to put toy horses in. If they also like the idea of large-scale public works, have them make a river by digging a trench in the mud or dirt. Then, add water as needed and a dam. When it rains, take a walk through your neighborhood to see which animals go under over and which come out in wet weather. Kids may also see birds swooping down to take a bath in nearby puddles. This is also a fine time to study worms that surface to breathe when their burrows fill with water. Then, enlist the kids in a Worm Rescue Squad and move any worms they find on the sidewalk back to the dirt so they don’t dry out. If you’re going to play in the mud, why not make some mud pies? If you have some old cake or pie tins, great. Otherwise, shallow plastic containers work just fine. Once the pies are “baked,” it’s time to make them beautiful. Encourage your children to scour the yard for pebbles, petals, and leaves that will make perfect decorations on top. Collect dirt, grass, leaves, twigs and acorns in a large container for a bountiful nature salad. Add some water, and it’s mud stew. To check out the DIRT report and for more outdoor fun ideas from National Wildlife Federation’s Be Out There movement, visit www.beoutthere.org. 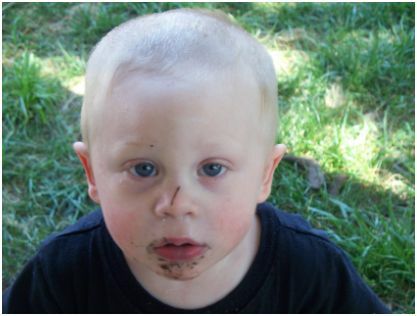 Parents can submit stories and photos of their own dirty kids and win some fun prizes. Thank you for visiting me! You have a very nice, informative blog here! I look forward to visiting more and snooping around.